HyperX Cloud™ is designed to meet the demands of serious console gamers. Cloud in silver has convenient in-line audio control that saves you from navigating through system menus and puts control at your fingertips. The durable aluminum frame is designed for long-lasting reliability and to withstand the damage of daily gaming. The 100% memory foam ear cushions and leatherette-padded headband provide award-winning comfort for those long weekends and late nights of gaming. HiFi capable 53mm drivers and enhanced bass reproduction pump out crystal clear high, mids and lows, and the closed cup design silences the outside world to completely immerse you in your game. Cloud's microphone can be adjusted the way you like it, and it eliminates background noise so you come across loud and clear. When you're ready to listen to music, simply unplug the microphone and stow it for later. HyperX Cloud has been certified by TeamSpeak™ and Discord and is compatible with Skype™, Ventrilo, Mumble, RaidCall and many more chat applications. During HyperX Cloud testing, no audible echoes, background noise or voice distortions were detected, so you and your team will be able to communicate clearly. HyperX Cloud's 3.5mm plug (4 pole) is compatible with PS4™, Xbox One™1, Wii U™, Mac® and mobile devices2, and it comes with a 2M extension cable with stereo and mic plugs for PC use. Cloud in silver features in-line audio control designed with console gamers in mind; players no longer have to navigate system menus to adjust volume and mute the microphone. HyperX Cloud's HiFi capable 53mm drivers and enhanced bass reproduction pump out crisp high-end, vibrant midrange and rich lows. The closed cup design blocks out outside noise to provide total gaming immersion. The adjustable, noise-cancelling microphone eliminates background noise so you'll be confident that you're communicating loud and clear. When it's time to listen to music, simply unplug the detachable microphone. HyperX Cloud has been certified by TeamSpeak™ and Discord and is compatible with Skype™, Ventrilo, Mumble, RaidCall and many other programs. During testing, no audible echoes, background noise or voice distortions were detected, so your team will have crystal-clear communication with Cloud. 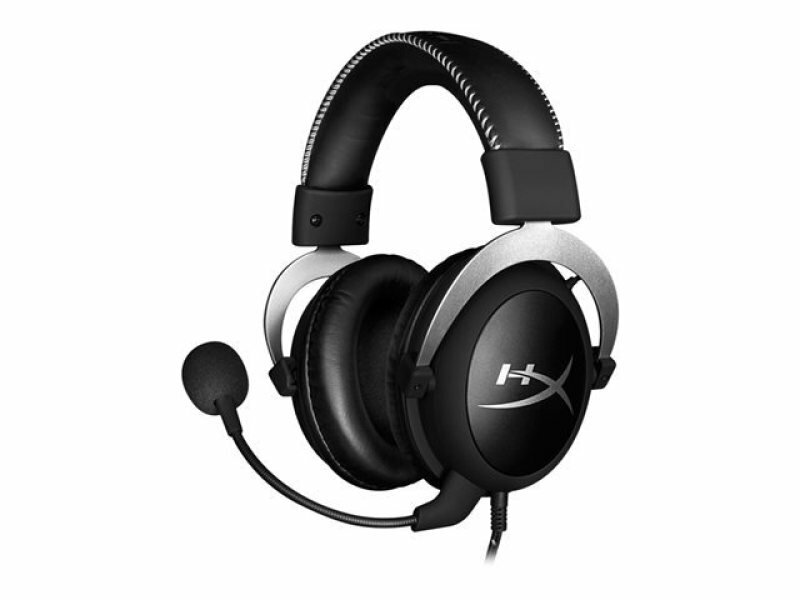 Cloud in silver provides you yet another HyperX style to choose from and comes with a high-quality mesh travel pouch to hold the headset, detachable mic and the 2M PC extension cable. HyperX Cloud's 3.5mm plug (4 pole) is compatible with PS4™, Xbox One™1, Wii U™, Mac® and mobile devices2 and comes with a 2M extension cable with stereo and mic plugs so PC gamers can get the same great audio experience.